I’ve been a fan of Smashing Magazine for a couple years now, and one of my favorite things about their blog is their Desktop Wallpaper Calendar series. Each month, they take in submissions of wallpaper designs from around the world, and post them to share with readers. It’s honestly something I look forward to seeing every month, because I love seeing the variety of design styles, and I always end up with new desktop backgrounds on all of my screens that fit the mood of the month to me. 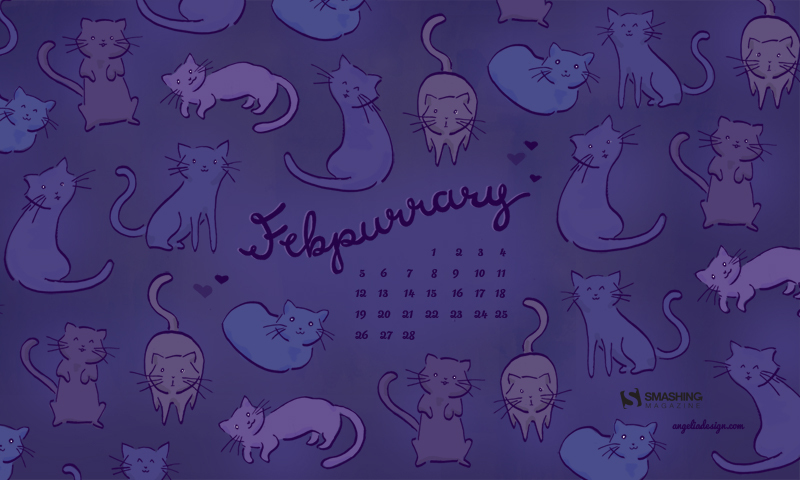 This month, I got around to submitting one, and it’s now available to download on their February wallpaper post. Funny enough, I actually started this design over a year ago – shortly after I got my cat. We adopted a stray black cat in December, and one night in January, I started doodling cats in different poses as I watched him. I wondered if I could make a fun pattern out of my sketches, and remembered seeing some nice patterns on Smashing Magazine that I could use for inspiration. I feel like I got stuck, and didn’t like where it was going, so I put it away and forgot about it for a while. I had the punny title “Febpurrary” floating around in the back of my head for a while, and this January, I was determined to redo it, just in time to submit it to the February calendars. Sometimes, it just takes time away from a design to realize what’s wrong with it. I know a lot of designers are against submitting work for free in any situation, but I can’t help but be a fan of this series. I love being able to download other designers’ work for free, just to glance at on my screen, and I like thinking that someone else may be inspired by my work, even if it is just a funny cat pattern.